All aspects of the self are salient in the classroom, and Parker Palmer underscores the primacy of the teacher's own identity. Research shows that various aspects of identity, such as gender, race, ethnicity, and sexual orientation, affect how teaching and learning happen in multiple, complex ways. When does identity enhance or undermine the presumed expertise or authority of the teacher? 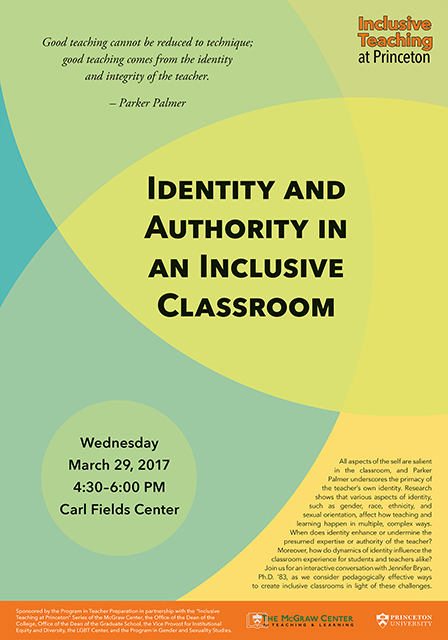 Moreover, how do dynamics of identity influence the classroom experience for students and teachers alike? Join us for an interactive conversation with Jennifer Bryan, Ph.D. '83, as we consider pedagogically effective ways to create inclusive classrooms in light of these challenges. Sponsored by the Program in Teacher Preparation in partnership with the “Inclusive Teaching at Princeton” Series of the McGraw Center, the Office of the Dean of the College, Office of the Dean of the Graduate School, the Vice Provost for Institutional Equity and Diversity, and the LGBT Center.